This system-wide server lets everyone in your network, whether at work or school, translate texts and communicate with each other in multiple languages. Your students or employees all need translation software on their computers to do their work. But did you know it's more economical to purchase a translation server they can all share... one they access via the company intranet, extranet or LAN. That way, you avoid the costs and labor involved in individual desktop installation. With IdiomaX Translation Server, you get the same great features of our desktop translation software but at a significant saving. 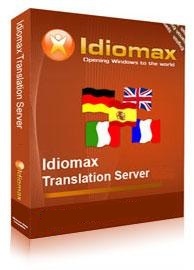 IdiomaX Translation Server is a web-based online translator that allows users to access the translation software without actually having it installed in their desktop computers. Instead, the translation engine and website are installed in the company's or school's server. A system administrator establishes who can use the system by setting up permissions and passwords. The online translator has several modes. It can be used to instantly translate short bits of text from various applications, allowing staff and students to communicate with each other and share information across multiple languages. It also allows them to upload longer documents, web pages, and emails to the server for translation and download later. The Translation Server provides translation for all types and sizes of files. And it does so with even more unique features than other online translation servers on the market. Five languages, seven language pairs included. Web-based interface elimates need for multiple desktop software installations. Compatible with browser and operating system of user's preference. Translates web pages while navigating. Translates whole documents in multiple formats like PDF, DOC, HTML, TXT. Various customizable dictionaries available during translation: user dictionaries, do-not-translate dictionaries, specialized dictionaries, translation memories and general dictionaries. Translation memories can save original and translated sentences to avoid translating same sentence again. Do-not-translate dictionaries can be customized to save words or phrases that should not be translated. Groups can share company dictionaries, department dictionaries, group dictionaries and user dictionaries. Other specialized dictionaries are included (see list below). Manual revision of translated text can be done to polish final text. Pentium 1.7 GHz or higher processor. At least 1 GB of RAM memory. At least 80 GB of free hard disk space. Microsoft Windows NT Server, Microsoft Windows 2003 Server or Microsoft Windows 2008 Server. Microsoft .NET Framework version 2.0. Microsoft SQL Server 2005 or Microsoft SQL Server Express 2005 or higher. Microsoft Windows Installer version 3.1 or higher. PC with any configuration connected to the server.